With the spawn in the rearview mirror and summer in full swing, big bass areas that were productive during the spring are now void of bites. Mystified anglers struggle to find fish while veteran anglers like YakGear Brand Ambassador Paul Lopes know where and how to catch them when the heat cranks up. Lopes is a lifelong bass angler. After years of being stuck on the banks of his favorite ponds and lakes, Lopes made his first foray into kayak fishing in 2015 and hasn’t looked back. 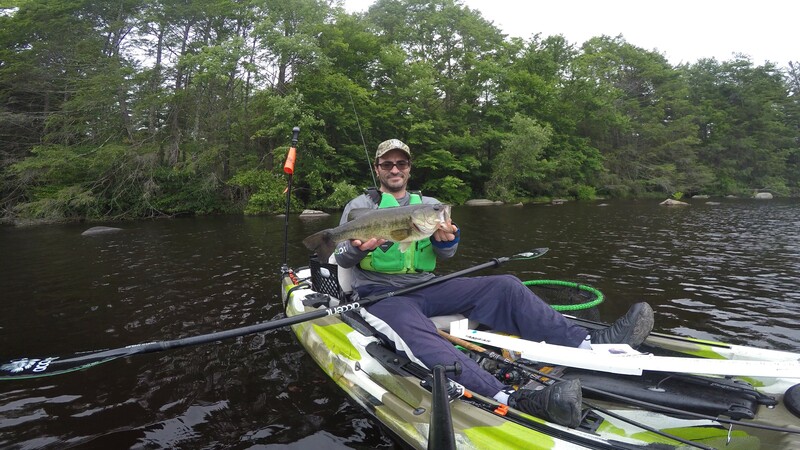 Fishing from a kayak has completely changed his approach to fishing for bass. The kayak angler fishes year-round and has tactics for every season. Once temperatures begin to rise, he knows it’s time to switch to summer bass techniques. While Lopes has had success fishing a frog in the lilies, his go-to bait is a 10-inch worm. Another go-to bait for Lopes is a swim jig with a black and blue trailer. “I love the swim jig,” said Lopes. “It’s so versatile as opposed to a football jig. I have had the most success using a black and blue swim jig with a matching trailer. While live bait is considered by many “old school” for catching bass, Lopes says live bait does have its place, especially with new anglers still honing their fishing skills. When the days get long and hot, Lopes also takes advantage of the cooler temperatures and calm winds offered by dawn and dusk. The angler throws wake baits and topwater baits to capitalize on the calm conditions. Summer bass fishing offers great action if you know where to find them and what to throw. Bass aren’t always deep during the summer so don’t rule out shallow water either. Once you can establish where bass are hunkering down during the hot summer months, it’s just a matter of getting out on the water and tossing your favorite baits.